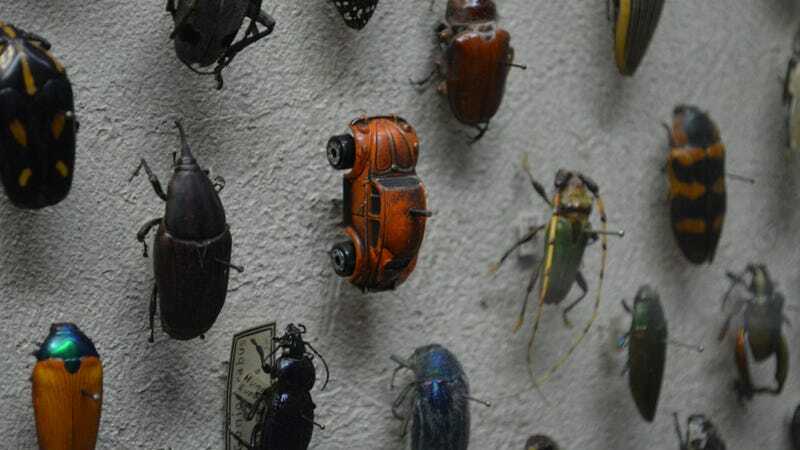 An eagle-eyed Redditor with both an automotive and entomological bent found this tiny Volkswagen Beetle pinned to a sample wall along with many of its friends from the order Coleoptera in the Cleveland Museum of Natural History. Well played, entomologist. I’m not exactly sure what genus that toy Beetle belongs to — it doesn’t quite seem to fit the Hot Wheels Beetle castings I could find, but it is pretty close to a Matchbox one. I think it’s a mid ‘90s Matchbox, based on the wheels, but I haven’t found the exact casting. I guess I’m not much of an entomologist. I can tell you that it looks to be based on a pre-’68 Euro-market Beetle, and whoever painted it did a good job making it blend well with all the actual dead beetles around it.